Here are three examples of the types of custom applications our Spiratube sewn ducting can be designed to suit. The picture on the top left shows our white and black Insulated FRAS Spiratube delivering conditioned air deep into the hull of the ship under construction, while our AP Spiratube (yellow and red) extracts dangerous fumes. 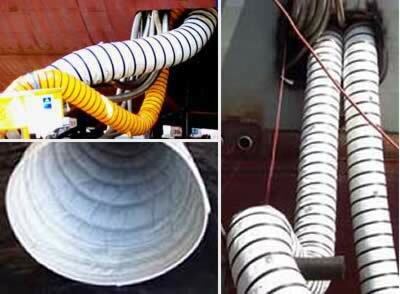 This ducting was made specifically to suit this ship building application. It is used to deliver cool clean air to the workers inside the hull of the ship keeping their working environment within OHS standards and making their job a lot easier. It features a thick foam insulating layer enclosed between an inner PU coated nylon liner and a heavy duty fire resistant, anti-static outer material. It has plain cuffed ends with attached clamps to enable a tight seal on the customer’s spigots. It also has tabs and eyelets every metre along the ducting to allow for easy mooring/suspension. It features a crush resistant galvanised spring steel wire helix and a protective outer PVC scuff strip (black) to prevent premature wearing due to abrasion when the ducting is being repositioned. In this case the ducting was made in 10 metre long lengths with an internal dimension of 356mm. This Spiratube was manufactured for extraction of fine dust in the prosthetics department of a major Melbourne hospital. The customer required the inlet end of the ducting to be 140mm and the outlet end to be 100mm. In this case it was requested that the duct be tapered over the first 500mm rather than gradually over the length of the duct. The duct is to be used under suction and therefore it has a close pitch to prevent collapse/retraction under vacuum. 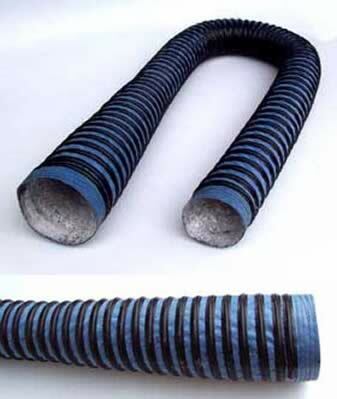 The material passing through the ducting is relatively abrasive so it was given an internal coating of rubber which not only seals the ducting it prevents wear from occurring on the stitching and/or the ducting wall. It is 2 metres long overall and proved to be an inexpensive and convenient solution to the customer’s problem. A truly portable ducting solution. 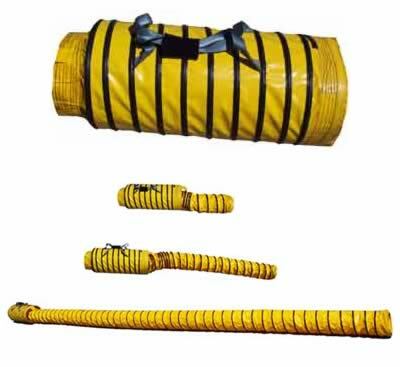 Self store Spiratube provides a simple and effective method of transporting long lengths of ducting. With the compressed ducting stored in its own convenient carry bag you can carry a length of ducting 10 times longer than the size of the bag. Can be made with built in worm-drive clamps at both ends, with tabs and eyelets and in virtually every style across the whole Spiratube range.